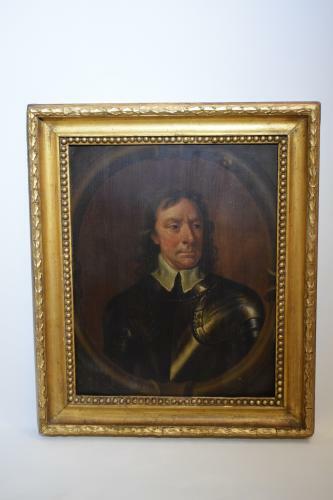 An 18th century portrait of Oliver Cronwell on oak panel, the frame 19th century, gilded. Oliver Cromwell (1599-1658) was an English military and political leader best known for his involvement in making England into a republican Commonwealth and for his later role as Lord Protector of England, Scotland, and Ireland. He ruled after Charles I, the king he ordered decapitated in 1649. In a more peaceful transition, Peter Lely inherited Anthony van Dyck's patrons and prestige. The fictive stone frame and the sitter's gaze into infinity hint at this being a posthumous portrait.